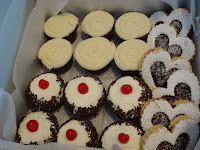 Cupcake, my love: Love is in the Air! Valentine's Day has to be one of my favorite holidays, not only does this holiday celebrate my favorite color (pink) but it also "allows" me to eat all the chocolaty goodies I want! I know, I know, Valentine's Day should be centered around love and being with the people you love, which for em it is, I have an amazing boyfriend, whom I am madly in love with (not to mention we're moving into our apartment today!). But you'd have to be a dummy to not think about chocolate on Valentine's Day! I mean how can you resist chocoalte covered strawberries, little chocolates with gooey filling inside, chocoalte cupcakes, chocoalte fondue, hot chocoalte with melty marshmallows, chocolate dipped cookies (I could go on forever, but I think you get the point). Another thing I love aboout Valentine's Day is think back to my elementary school days. We had to make our Valentine card holder out of red and pink construction paper, decorating it with sparkly glue and colored markers. There were stick figures of boys and girls holding hands, and crocked hearts floating around their heads. Then there was the excitment of going to the store and picking out your cards to give all your classmates...Carebares or Beauty and the Beast? Carebares or Beauty and the Beast? Uum...Beauty and the Beast! The worst part was actually having to write all your classmates names on the cards, but with a few hours of some good Nickelodeon that task seemed to whiz by. On Valentine's Day I'd wak to school in anticipation, praying that nobody else had bought the same cards as me, but that wish almost never came true :( It was finally time to pass out the cards and hurry back o my seat to tear them open and read all the notes. And of course there were those cute elementary school scribbled remarks on a Transformers card that always made me blush...Sadly those days are long gone and here I am all grown up planning a "real" Valentine's Day night! 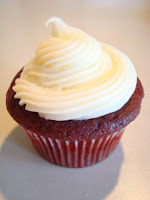 First we have Black Forrest Cupcakes (chocolate cupcakes with cherry pie filling, topped with vanilla buttercream) Second is the ever popular Red Velvet Cupcake. 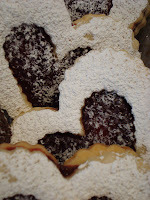 Then Raspberry White Chocolate Shortbread Hearts! But the best one of all..the Valentine Goody that I'm entering in "A Heart For Your Valentine" Blogging Event" is one of Donna Hay's recipes. 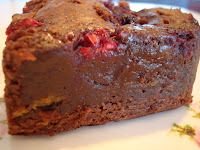 It's calles Raspberry-Spiked Chocolate Brownies and they are to die for!! 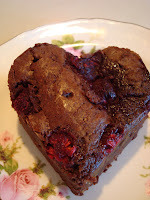 I used a cookie cutter to cut these moist, gooey brownies into cute little hearts! Happy Valentine's Day everybody!! Those all look so delicious! 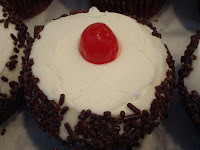 I think I'd jump for the black forest cupcakes first. Happy moving! Wow, your desserts are so impressive. Happy Valentine's Day! Hi Steph me again but I have tagged you for a meme - hope you don't mind!